While progress has been made in terms of revenue and contract transparency, the impact of such approaches on increased accountability remain largely unknown. Without strong regulatory frameworks and competent institutions, transparency alone is unlikely to achieve sustainable development outcomes. We need flexible, collaborative and adaptive management practices anchored in a solid understanding of the political economy to adapt to changing circumstances and local context. Sound and sustainable fiscal regimes – and a leadership committed to the use of revenues for the benefit of all – is also key to translate resource wealth into sustainable development outcomes. Natural resources can bring considerable wealth to a country, contributing to livelihoods, food security and the green economy, as well as generating trade and enterprise at local, national and international levels. But with large volumes of revenue at stake, the extractives sector is also often associated with poor governance and corruption. The large amount of rents generated by natural resource revenues provide incentives for rent- seeking, corruption and patronage, and can lead to poor and inequitable investment and spending practices. 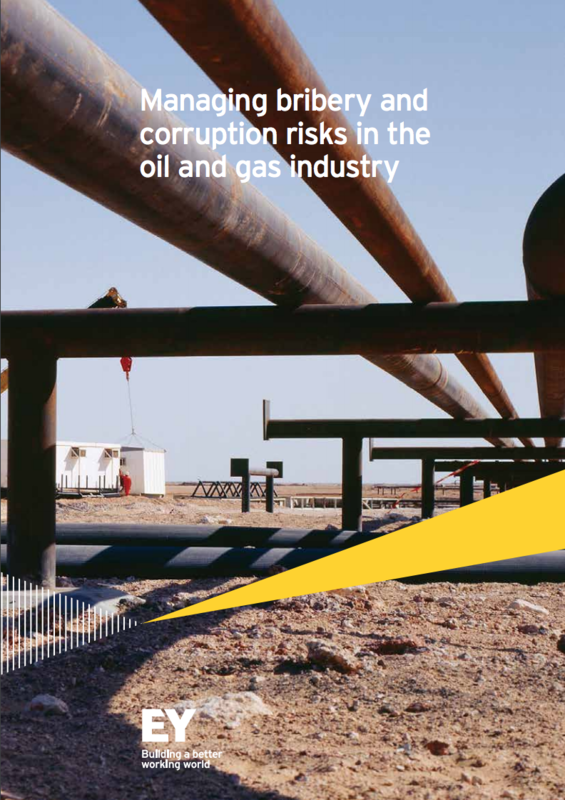 Corruption risks can occur at every step of the extractive value chain, from awarding of mineral, oil and gas rights, regulation and management of operations, revenue collection and management, to commodity trading and public spending (OECD 2016). The governance of extractive industries is therefore critical in determining whether natural resources can benefit or harm the country. Natural resource governance refers to “the norms, institutions and processes that determine how power and responsibilities over natural resources are exercised, how decisions are taken and how citizens – men, women, indigenous people and local communities – participate in and benefit from the management of natural resources” (International Union for the Conservation of Nature, IUCN website). Several dimensions of governance are instrumental to ensure sustainable exploitation and fair distribution and to maximise the contribution of natural resources to development outcomes. Revenue and contract transparency through initiatives such as the Extractive Industries Transparency Initiative (EITI) have been promoted as a means to increase accountability in the context of natural resource revenue management. However, transparency alone is unlikely to attain sustainable development outcomes from extractive industries. Transparency must be supported by strong regulatory frameworks, competent and strong institutions, flexible, collaborative and adaptive management practices, a solid understanding of the political economy at the local level, sound and sustainable fiscal regimes and a leadership commitment to using the revenue to promote sustainable development outcomes (DFID 2016). Corruption risks can arise at any point in the extractive value chain – from the awarding of mining, oil and gas rights, extraction operations and regulation phases to revenue collection and distribution phases – and take many forms, such as bribery of foreign officials, embezzlement, misappropriation and diversion of public funds, abuse of office, trading in influence, favouritism and extortion, bribery of domestic officials and facilitation payments (OECD 2016). A number of emerging trends are likely to exacerbate those risks and create new ones, including the proliferation of actors involved in resource extraction, the shift towards renewables, and the rapid growth in the number of climate change projects in contexts where corruption prevalence is high (Williams and Dupuy 2016). At the host country level, transparency initiatives are not enough to address these risks. Institutional quality and governance are important factors for mediating the negative impacts of resource abundance including a strong legal and institutional environment, an effective judiciary, functioning systems of political accountability and anti-corruption (EITI 2016). In particular, the laws, regulations and institutional practices need to enable the criminalisation of bribery, comprehensive disclosure of information, open competition and accountability (Natural Resource Governance Institute 2013). As the awarding of contracts and licences is an area particularly vulnerable to corruption, the regulatory framework needs to provide for fair, clear and transparent awarding procedures, access to information and contract transparency (Le Billon 2011). Disclosure of information and transparent reporting practices by government agencies also contribute to building accountable systems for collecting, managing, investing and spending revenues, and translating revenue transparency into more accountability in natural resource management (Lindner 2014). Finally, adequate safeguards, checks and quality controls need to be in place to guard against conflicts of interest and undue discretion, with oversight mechanisms such as audits, parliamentary oversight, civil society and media monitoring, as well as corporate transparency and monitoring (Natural Resource Governance Institute 2013; Lindner 2014). Although not a panacea, multi-stakeholder processes – involving representatives from civil society, government and the private sector – are increasingly viewed by donors as a means to promote accountability and address corruption- related challenges in natural resource management (Søreide and Truex 2011). 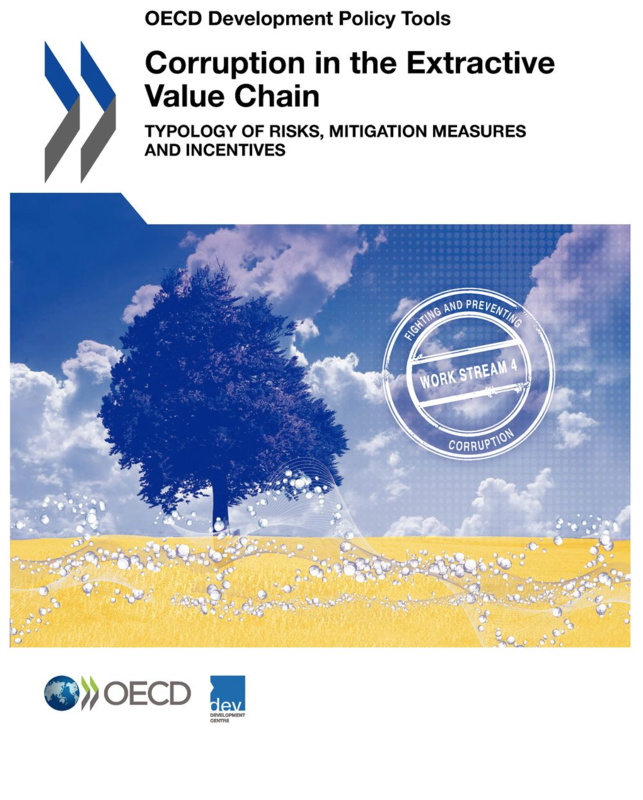 Mitigating measures need to address both the supply and the demand sides of corruption, domestically and internationally, and target the incentives of both private and public actors (OECD 2016). This report is intended to help policy makers, law enforcement officials and other stakeholders to strengthen prevention efforts, at both the public and private levels, through improved understanding and enhanced awareness of corruption risks and mechanisms across the extractive value chain. revenue spending and social investment projects. The report recommends avoiding one-dimensional approaches to fighting corruption and prioritises instead approaches tackling the supply and demand for corruption domestically and internationally. Mitigating measures targeted at home and host countries and extractive companies’ incentives are expected to lead to voluntary changes in behaviour for private and public actors alike. Williams, A and Dupuy, K. 2016. This U4 Brief surveys corruption in the natural resource sector, assessing what new trends in the sector mean for corruption risks. The main trends are the proliferation of actors involved in resource extraction, the shift towards renewables, and the rapid growth in the number of climate change projects, which may all entail novel corruption risks. regularly revisit core programmatic assumptions and theories of change. This industry-wide analysis presents the main vulnerabilities to corruption, (bid and tender process, licences and permits, customs, joint ventures, misappropriation of assets, etc.) followed by a section on how to establish effective internal control mechanisms based on the findings of a comprehensive corruption risk assessment programme. Ensuring fair awarding procedures through criminalisation of bribery, clear and transparent awarding procedures and contract transparency. Mechanisms for monitoring operations (also at state-owned enterprises) that include audits, parliamentary oversight, civil society and media monitoring, as well as corporate transparency and monitoring. Systems for collecting revenues in a transparent and accountable manner through sound fiscal regimes and transparent reporting. Determining accountable ways to manage, invest and spend revenues, such as through sovereign wealth funds and strategic planning processes. Dyna, H., & Sothath, N. 2013. Striking the right balance of saving/spending through the creation of an oil fund. Standardising oil contract types to minimise the complexity of revenue flows, making it easier for the government to monitor contracts. Developing production/monitoring capacity for the relevant authorities. Developing clear roles among government agencies in revenue flows and spending. Enhancing budget transparency and accountability, including setting up a review board with representatives from government, donors and civil society to promote transparency and accountability in resource revenue management. Natural Resource Governance Institute. 2013. 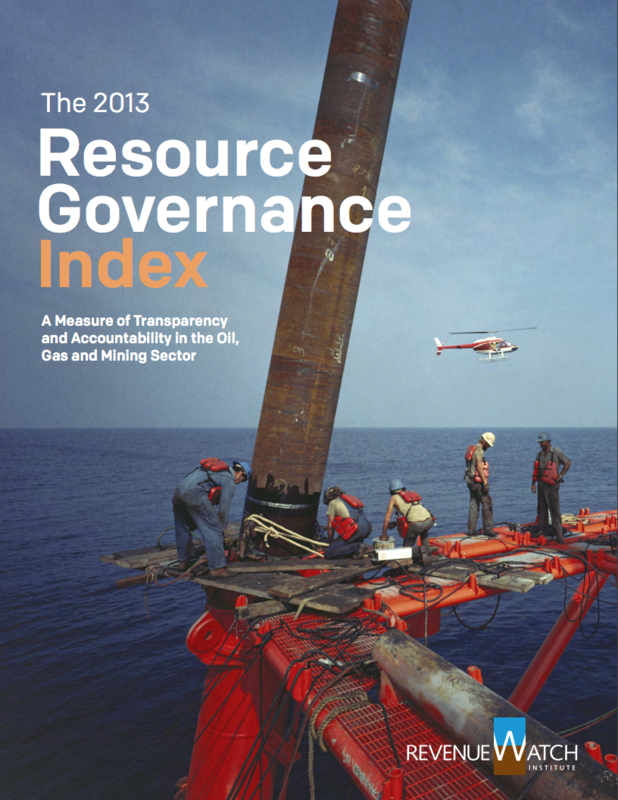 The Resource Governance Index (RGI) measures the quality of governance in the oil, gas and mining sector in 58 countries. The RGI scores and ranks the countries, relying on a detailed questionnaire completed by researchers with expertise in the extractive industries. The index assesses the quality of four key governance components: institutional and legal setting; reporting practices; safeguards and quality controls; and enabling environment. It also includes information on three special mechanisms used commonly to govern oil, gas and minerals— state-owned companies, natural resource funds and subnational revenue transfers. Disclose contracts signed with extractive companies. Ensure that regulatory agencies publish timely, comprehensive reports on their operations, including detailed revenue and project information. Extend transparency and accountability standards to state-owned companies and natural resource funds. Make a concerted effort to control corruption, improve the rule of law and guarantee respect for civil and political rights, including a free press. Accelerate the adoption of international reporting standards for governments and companies. Multi-stakeholder processes – involving representatives from civil society, government and the private sector – are increasingly viewed by donors as a means to promote accountability and address corruption-related challenges in natural resource sectors. However, the establishment of a multi-stakeholder group will not necessarily imply that corruption is addressed directly and thus should not be the only approach towards building accountability. Multi-stakeholder groups rarely have the authority to enforce legislation, and the various stakeholders may be subject to incentives that conflict with their mandate. Potential conflicts of interest within the group, as well as the balance of power among stakeholders and other external constraints, are also likely to inhibit their effectiveness. Financial support should therefore be offered only after appropriate scenario analysis and study of the actors’ roles and incentives. The authors conclude that such approaches are not well-suited to implementing a complex initiative since they are cumbersome by design and vulnerable to conflicting interests. Oil, gas and mining laws and contracts establish the terms of what a country might gain from extraction. Regulatory frameworks determine the revenues and responsibilities for actors involved in the industry, including the private sector and the government, defining certain requirements regarding exploration, field development activities, technologies applied, the number of operators, the role of national oil companies (NOC), and monitoring opportunities. Yet, the process of establishing the legal and institutional framework for sector activities is not always transparent, with many opportunities for vested interests to influence the regulatory process. This may result in the “manipulation of frame conditions to attain exclusive benefits to individuals or groups at the cost of social benefits” (Williams, Al-Kasim & Søreide 2008). It is, therefore, important to address corruption risks in the regulation of extractive industries and promote transparency throughout the entire decision-making process, from new laws and bidding to rules regulating revenue management and spending. It is also important to ensure participation in making policies and regulations regarding the exploration, exploitation and distribution of oil, gas and mining benefits, the enactment of clear rules governing the negotiations between the government and extractive companies during the licensing process, and stronger oversight by the government and civil society (Martini 2015). This paper focuses on how and why corruption can distort or prevent efficient regulation of the oil sector. It addresses the prevalence of corruption in the sector, and how the regulatory framework can be co-opted by special interests employing corrupt means, particularly in the area of licensing. The authors suggest capacity building and training of regulators in improving oil governance are important, including for creating a space for policy dialogue on corruption as well as voluntary initiatives and codes for the industry. However, they should not replace state- sponsored, formal regulation. Indeed, promoting formal procedures for regulation at each stage of petroleum operations should be the underlying aim for donor strategies to address corruption in oil, with particular attention given to prequalification procedures, the criteria for licence awards, the renegotiation of contracts, and the drafting of field development plans. Specific oil- related regulations should be coupled with enforced transparency via the enactment of access to information laws, close monitoring of decision-making processes and the opening up of markets via reform of public procurement systems. A comparative study of mining codes in Africa suggests that while the quality of national governance is a key determinant of the development outcome of extractive industries’ activities, it needs to be accompanied by legal and fiscal frameworks designed to meet development objectives and which are implemented in the context of good international policies and rules. Following the discovery of petroleum and gas in Lebanon, the country has taken several steps to establish an adequate institutional and legal framework that would allow effective exploration and management of resources. Fighting corruption and ensuring the emerging petroleum sector is governed in a transparent and accountable manner remain major challenges. Important decisions regarding petroleum exploration and the management of funds are expected to be made in the coming years, including the licensing of oil blocs and the establishment of a sovereign fund. It is essential that adequate mechanisms are in place to enhance transparency, accountability and prevent corruption. In particular, increased participation in making policies and regulations regarding petroleum exploration, the enactment of clear rules governing the negotiations between the government and oil companies during the licensing process, and stronger oversight by the government and civil society are key. The governance of natural resources is complex, with a myriad of competing rights, users and governance structures, involving a wide range of actors at multiple levels and across a broad range of temporal and geographical scales. This complexity calls for flexible and adaptive forms of governance, with systems that can respond quickly to change and are firmly anchored in the local political economy (DFID 2016; Barnes & Child 2014). Such an adaptive management approach is likely to accommodate the interplay between the realities of the field and the application of the sector’s governance frameworks in a context where natural resource governance increasingly involves decentralised arrangements, with approaches such as community based natural resource management (CBNRM) that seek to empower rural communities and beneficiaries and add a level of complexity to the management of natural resources (Anderson & Mehta 2013). In such a context, understanding the political economy and formal and informal institutions that underpin access to, and control over, natural resources is critical for the design and implementation of effective governance frameworks (DFID 2016). Much natural resource governance involves decentralised arrangements, but these have not always delivered improvements in natural resource sustainability, partly due to the nature and degree of power-sharing, where insufficient power and resources are devolved to decentralised structures. Elite capture is also frequently associated with community based natural resource management, reflecting pre-existing power relations within communities and the capture of benefits by state actors within state-governed regimes. Financial assistance for the natural resource governance structures is essential over many years, as is strong, appropriate support by central government through legislation and technical support. “Bridging” organisations, such as non- governmental organisations, can be helpful to build trust between government and resource users, as well as to reduce the potential for capture of community-based structures by those with more power and wealth. Decision-making happens at multiple levels and by different actors, including different parts of government. Yet, governance is often fragmented, with little coordination and cooperation. Given the complexity of many natural resource situations there is a growing interest in an “adaptive” approach to respond and adapt to change and accommodate a fluid landscape, be it political, ecological or social. This implies paying greater attention to lesson learning and flexibility and focusing on processes rather than structures, building the capacity of many stakeholders, building mechanisms for generating, sharing and using information, and building systems that are able to respond quickly to change. Access to, and control over, natural resources is mediated by a range of institutions, formal and informal. Institutions beyond those specifically created for natural resource governance are often important, including friendship, kinship and power relations within a community. Political economy analysis, “thinking and working politically”, and power analysis can help identify and analyse institutions and power relations, and should inform the design and implementation of support for the governance of natural resources. While lack of accountability in general is perceived as a common problem in natural resource governance, lack of downward accountability to resource users is noted as a particular challenge. More needs to be known about how to generate or induce demand for accountability, both by village-level constituencies from district authorities, and by the districts from the centre, and what mechanisms can be used to deliver accountability. Barnes, G & Child, B. 2014. This book brings together authors from various disciplines to promote an integrative understanding of cross-scale and adaptive governance in Africa and Latin America. The authors make the case for reaching beyond decentralisation to promote adaptive governance that serves local priorities, but through interactions with local, district, national and global governance structures. 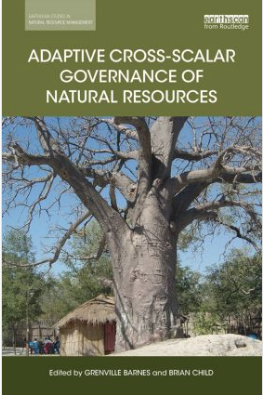 This book synthesises experience with the governance of different natural resources from a broad geographic perspective and provides theoretical and practical suggestions for taking adaptive natural resource governance forward, including participatory methods for measuring and monitoring governance. Anderson, J. & Mehta, S. 2013. Community based natural resource management (CBNRM) is an approach to empowering rural communities with the knowledge, skills and authority to sustainably manage natural resources. Successful CBNRM initiatives require sustainable natural resource management; benefit streams (financial, social and economic) that exceed costs; and good governance. Adaptive management and a systems approach, to accommodate the interplay between the realities of the field and the application of principles, are needed. The assessment revealed interesting examples of “collateral success”, the sometimes hidden improvements in livelihoods and the environment that occur in parallel or tangentially to the main objective of the CBNRM initiative. development controlled by the community. Existing work on corruption in CMBSs places too much emphasis on administrative measures to manage risks and prevent wrongdoing. The author recommends to first understand local political dynamics and ambitions for development, and then use these insights to improve CMBS design. The paper makes 10 policy recommendations to improve CMBS design. Appropriate schemes/looking for best options to distribute mining benefits. Flexible design of the benefit scheme that can be adjusted if problems arise. Regular communication between mining operators and beneficiary communities about the operation of a benefit sharing scheme. Much progress has been made in recent years to improve the governance of natural resources through transparency initiatives. Primarily focused on revenue transparency, they gradually extend to other segments of the value chain, such as contract transparency. In particular, accountability of natural resource management could greatly benefit from extending the transparency agenda to commodity trading or the financial institutions that provide financial services to a range of resource actors, sectors that are traditionally very opaque (Natural Resources Governance Institute 2015; Isaksen & Williams 2016). Promotion of transparency and accountability in natural resource revenue management is seen as a means to better manage revenues from high- value natural resources. In many cases, donors require that the receiving countries increase transparency in the management of natural resource revenues, for example, by joining the Extractive Industries Transparency Initiative (EITI), or by making relevant changes in legislation (EITI 2016). Aside from EITI, there are several other global initiatives seeking to promote greater transparency and accountability in the management of natural resources, such as the Kimberley Process Certification Scheme (KPCS), the Publish What You Pay (PWYP) coalition and the privately owned International Council of Metals and Mining. Yet, while increased transparency is becoming a reality in many countries, the challenge is the extent to which citizens can use the disclosed information for building understanding, informed debate and action. There is also a lack of evidence of development impact of transparency and accountability initiatives such as EITI and more generally the extent to which they improve the governance of natural resources. In addition, transparency in natural resource governance largely focuses on certain segments of the sector’s value chain and publicising the information on “revenue transparency” of certain high-value natural resources (EITI 2016). There is a growing consensus on the necessity to extend transparency requirements beyond the minimum requirements of EITI and across the entire natural resource management value chain to cover additional resources, additional disclosure requirements, and additional measures to promote good management of resource revenues (AFDB 2016). In particular, beyond revenue transparency, the transparency agenda should also cover licensing, contracts, physical resource flows, and other production factors, as well as public expenditure (Le Billon 2011). This article provides a review of the literature on transparency and accountability in the context of natural resource revenue management, discusses how transparency is conceptualised and understood to function in this context, and assesses the existing evidence for the proposition that increased transparency leads to more accountability and improved natural resource governance. Transparency in resource governance has so far focused mainly on “revenue transparency”, which is commonly used interchangeably with transparency in resource governance more generally. However, there is a growing consensus in the literature that “transparency alone” is not enough and that other conditioning factors, such as education levels, an effective judiciary, pre- existing systems of effective political accountability and functioning anti-corruption systems must play key roles in translating revenue transparency into more accountability in natural resource revenue governance. Transparency initiatives may then be most effective when combined with wider processes of institutional change within contexts where relatively well-functioning mechanisms for accountability already exist. In addition, factors conditioning the relationship between information disclosure and more accountability are closely embedded in a country’s history, culture, political economy and prevailing modes of governance. There is a need to understand the impact of transparency by looking at the contextual environment in which they are implemented. Finally, it is important to have realistic expectations about the potential impact of such transparency initiatives on improving natural resource governance, as setting unrealistic broad goals carries the risks of turning the scheme’s very real achievements – in terms of increased extractive sector financial disclosure – into failures. This article critically examines the impact, up until 2009, of the EITI. Through a panel study, including approximately 200 countries, the impact of the EITI is examined on economic development and quality of governance. Results suggest that the negative effect of resource abundance on GDP per capita, the capacity of the government to formulate and implement sound policies and the level of rule of law is mitigated in EITI countries. However, the EITI has little effect on the level of democracy, political stability and corruption. The study concludes that there are some early indications that the EITI has been successful in protecting some nations from selected elements of the resource curse, which is an encouraging result given the relatively short time period since the founding of the EITI. The proliferation of initiatives to improve the transparency and governance of the extractives sector is driven by motivations to increase public awareness regarding the management of non- renewable natural resources, to reduce opportunities for corruption between the public and private sector, and to prompt greater external oversight of the industry. For example, EITI is likely to make indirect contributions to good governance outcomes by a) establishing an emerging standard that is agreed to by domestic governments and corporations, b) providing a policy platform to encourage multi- stakeholder dialogues, and c) creating international networks of civil servants, corporate executives, CSO activists and development practitioners with shared standards and commitment to good natural resource governance. However, it remains an empirical challenge to assess the direct impact of such initiatives and demonstrate that more revenue transparency and improved budgeting standards lead to improved fiscal performance or better income redistribution. Natural Resource Governance Institute. 2014. Maximising public reporting of key data: this includes disclosing revenues, costs, revenue flow between NOC and the state, production, plans, results of oil trading and quasi-fiscal activities. Securing independent financial audits and publishing the results: this includes commissioning audits by skilled independent professionals and making results available to citizens. Ensuring effective oversight: this includes ensuring responsibility of NOC and its officials to answer to the legislature without unduly constraining decision making. Despite the many benefits that contract transparency offers, there is some persisting resistance to providing systematic access to extractive industry contracts and confidentiality clauses – a common and legitimate feature in contracts between private parties – are being used to prevent disclosure of information about contracts (Rosenblum & Maples 2009). In recent years, contract transparency is gaining momentum with the call for transparency requirements of initiatives such as the EITI to be extended to other segments of the extractive sector revenue chain, including licensing and contracts. Initiatives such as the Open Government Partnership support this emerging trend. As a result, contract and licence disclosure has considerably increased across countries in recent years (Pitman & Hubert 2017), and countries as diverse as Liberia, Timor-Leste and the United States have started publishing contracts (Rosenblum and Maples 2009). However, despite this progress, contract transparency can be strengthened by increasing the numbers and types of contract available to the public, making them easy to find, browse and use, and providing guidelines for disclosure practices and monitoring contract disclosure. Efforts of countries such as Mexico to implement the open contracting data standard in a number of areas (including in oil exploration and extraction tenders) and the EITI are setting an example, with innovative transparency measures for contract management (Natural Resource Governance Institute 2017). Pitman, R. & Hubert, D. 2017. Citizens have the right to know the terms of the resulting deals governing the exploitation of publicly owned natural resources. These terms are contained in licences, contracts, regulations and legislation. While regulations and legislation are usually public, licences and contracts often are not. 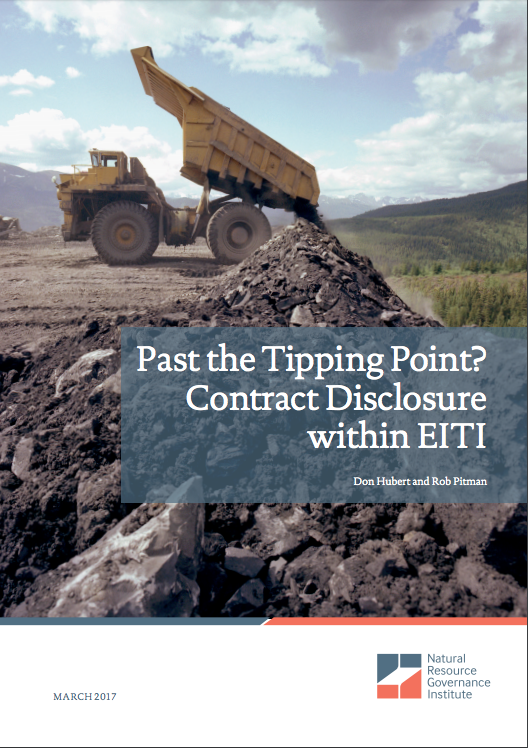 The EITI encourages contract disclosure through its standard. This report assesses the extent to which governments of resource-rich countries have taken up the recommendation and finds that disclosing the contracts and licences that detail the terms of resource exploitation has become more common, with well over half of EITI implementing countries disclosing at least some of these agreements. However, there is room for improvement in terms of increasing the numbers of contracts available to the public, making contracts easy to find, browse and use, establishing rules to guide disclosure practices and providing current information on contract disclosure. Natural resource deal renegotiation must be thought through strategically, taking into consideration both the commodity price cycle and political economy impacts. When circumstances such as price are in the government's favour, it is important for officials to act quickly to achieve the best possible deal. Waiting or overestimating the government's bargaining position runs the risk that volatile factors, such as commodity prices, may change in an unfavourable direction. Finally, the difficulties of deal renegotiation underscore the importance of ensuring that initial agreements are strongly negotiated in the first place, including provisions (such as fiscal terms) that are sufficiently flexible to adapt to changing circumstances so as to avoid renegotiations where possible. Renegotiations can potentially be anticipated by including periodic review mechanisms in contracts. Another essential element is investing in government negotiating capacity (e.g. having an established negotiating team, bringing in outside support – if necessary – early in the process, adopting a strong communications strategy, etc.). Natural Resource Governance Institute. 2017. Including a large library of documentary information on an online platform, including relevant laws and regulations. Publishing the full text of contracts, as well as a summary of key contract terms designed to facilitate user comprehension. Creating a strong structure that will facilitate the publication of detailed information on the implementation and monitoring of “contracts”, which, if systematically populated, provides a strong basis for citizens to track. Providing basic information on the licences that have been granted to Pemex, including links to the contracts themselves on the Secretariat of Energy website. Consulting with stakeholders and experts, both within Mexico and internationally. Three types of contracts are common in the oil, gas and mining sector: production sharing contracts (PSC), concession agreements and technical service agreements. Oil and gas contracts, even when signed, are rarely disclosed to parliament or the public, even though they contain important information such as the financial terms of a deal, the duration of the license, procedures to renew or terminate the contract, the management of operations, right of access to resources, dispute settlement procedures, etc. Parliaments are well placed to advance contract transparency through legislation and oversight and, in many countries, members of parliament have successfully championed this issue. This briefing provides parliamentarians with information they can use to make motions to support contract transparency and challenge contract secrecy. Rosenblum, P. & Maples, S. 2009. This report examines the points of resistance to contract disclosure by governments and companies, analyses their validity from a law and policy perspective, and comes to conclusions about whether and the extent to which contracts can legally be made public since the confidentiality clauses most commonly used in the industry do not fully prevent most forms of disclosure. It seeks to identify what information may legitimately and reasonably be kept confidential, and how the issue can be addressed more effectively by civil society institutions. The authors argue that contract transparency is critical to addressing better resource management and bringing contract stability to an industry that sees its contracts renegotiated more than any other. Contract disclosure also enables governments to negotiate better deals as the information asymmetry between governments and companies closes. Commodity trade refers to the international trade in primary goods that can take the form of a normal exchange of goods for money or can be conducted by means of futures. The need for raw materials and natural resources are increasing and commodities are becoming strategic goods for both producing and trading countries. However, commodity trading can only translate into development outcomes for producing countries when they receive a fair deal in the production and sale of the resources, and spend the revenues in ways that benefit the public. There are major corruption risks associated with commodity trading that have received little attention so far. Commodity trading is also a notoriously opaque sector of activity, not least because many of the companies involved are not publicly listed and due to the absence of full reporting and clear regulatory guidelines, making the sector highly vulnerable to corruption risks. Yet, this is an area that has received little attention so far from a transparency and anti- corruption perspective. Commodity trading is a sector of significant strategic importance that is exposed to major corruption risks that are not always sufficiently known or acknowledged. Generating high financial flows, trading companies often operate in high-risk countries with weak governance, institutions, rule of law and limited state accountability. The sector is also notoriously opaque and poorly regulated, with low levels of transparency and accountability. Against such a backdrop, corruption is widespread, with practices ranging from bribery, money and commodity laundering, and various forms of favouritism. A number of measures can be envisaged to mitigate corruption risks in commodity trading, including transparency of commodity sales, open and transparent tenders, transparency of payments, specific due diligence processes covering both the production conditions and trading partners, the establishment of supervisory authorities as well as transparency of beneficial ownership. Banks and financial intermediaries can also potentially play a role in the process. Natural Resources Governance Institute. 2015. Transparency should feature across traders’ engagements with public sector institutions, including but not limited to the crucial issue of commodity sales. The EITI has catalysed some progress already, and could do more by clearly requiring the disclosure of data that is broken down by individual sales. Due to the large number of commodity traders based in Switzerland, the Swiss government should include trading in its forthcoming extractive industry reporting regulations, and encourage governments of other major trading hubs to follow its lead. Companies and governments have individual responsibilities to disclose information, and can emulate emerging good practices. There are major corruption risks in the role of banks in providing financial services to a range of resource sectors as illustrated by the case of Mozambique (Isaksen & Williams 2016). Existing transparency initiatives have also not been primarily designed to address the risk that revenues from natural resources may be misappropriated and illicitly transferred (Le Billon 2011). At the international level, curbing illicit financial flows generated by the sector implies increasing transparency in the global financial system, putting greater pressure on banks to ensure that they are not dealing with the proceeds of corruption and preventing corrupt leaders’ access to the international financial system. This also involves taking appropriate measures to trace and repatriate stolen assets to their countries of origin (Isaksen & Williams 2016). Sanctioning the banks and reforming domestic financial services rules and regulations in the UK and Switzerland. Sanctioning corrupt politically exposed persons responsible for the loans. Pursuing international asset recovery measures based on the Mozambique audit. Introducing a multilateral body for monitoring odious debts and their likelihood. Countries highly dependent on natural resources are among the most severely affected by the problem of illicit financial flows. This paper presents the link between natural resources and illicit financial flows at different stages of the extractive value chain and across different extractive industries. Most existing transparency initiatives to address governance issues in extractive sectors have not been designed with illicit financial flows in mind. But extractive industries’ initiatives can be improved in this regard, with the help of development aid and other stakeholders. Extending transparency and accountability up and down the value chain, including contract and license transparency as well as engaging extractive-sector trading and banking partners in efforts to address money laundering. Moving from voluntary to mandatory transparency and translate transparency into accountability. Connecting anti-corruption, illegal exploitation, and tax agendas. Promoting greater transparency in markets, and notably on prices to reduce illicit financial flows. Ensure corporate reporting on a country-by- country basis.